If you are thinking of a Deerhound as your dog of choice, there are a number of things to consider before you make the final decision. First off the Scottish Deerhound is a large breed dog that requires space to live inside the home but they also require adequate space to run and play outdoors. Second they are a sighthound, which means that they are bred and raised to hunt prey with their sight rather than sent, and to accomplish this they have an athletic build and incredible stamina that must be nurtured. This means that the typical Deerhound will get along quite well with other dogs, but do not do well with other types of pets, because they may have the tendency to chase them. Often, a Scottish Deerhound will behave quite well with a pet cat while the both of them are indoors. However, if both are let outdoors, the cat may immediately become the object of a chase. Third item is the Deerhound coat is a fur to which many individuals develop or have allergies. If any family member suffers from allergies then perhaps, another breed should be considered. Fourth, they are not designed to be watchdogs, as they are too loving to everyone they meet. In fact, many will sleep right through the ringing of your doorbell. However, they can be shy with strangers, and should be socialized early on to avoid them being uncomfortable with visitors in your home. They can become easily stressed and are not happy in homes that are overly noisy or chaotic. Fifth, Young Deerhounds can sometimes, depending on the individual, be quite destructive especially when they are not given sufficient exercise; however, the average adult Deerhound may want to spend most of the day stretched out on the floor or a couch sleeping. 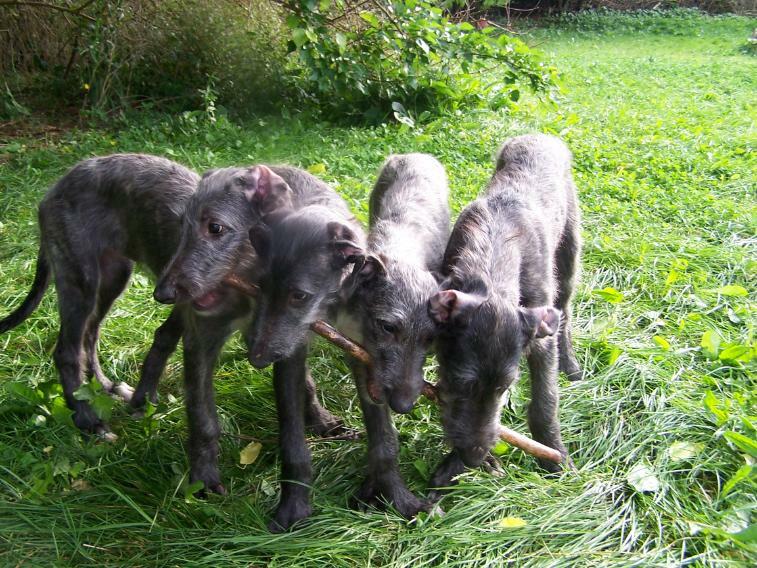 They do require a stimulus, preferably another Deerhound, and a large area to exercise properly and frequently. They are gentle and docile indoors and are generally good around company and children (however they require supervision with young children due to their size). Sixth, they can be a bit stubborn and a little slow to obey commands if they are not appropriately trained. It is important to give them a great deal of positive reinforcement during training to instill in them the importance of obeying their master. All that being said the Deerhound can be a terrific companion if you are prepared to respect their nature and work with them as opposed to having them work for you. If I might add another suggestion, take the time to go to a dog show near you and meet with breeders and their dogs to get a better understanding and appreciation for the breed before you invest time, money and energy into the purchase of a puppy. Enjoy!!! !